Thor is back on the big screen, and the critics seem pretty happy about it. According to the Daily Telegraph, Thor: Ragnarok is one of the Marvel Studios' "best films to date... funny, charming, dazzling [and] gorgeously designed." 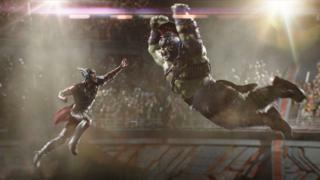 The film, says Variety, is "easily the best of the three Thor movies", with "self-aware punchlines throughout". Empire, meanwhile, gives four stars to a superhero adventure it describes as "a full-bore comedy using blockbuster spectacle as a backdrop for gags". Thor: Ragnarok, which follows 2011's Thor and 2013's Thor: The Dark World, sees the titular god of thunder, played by Chris Hemsworth, face a fearsome new adversary. This new character, named Hela, is "played with haughty relish" by Oscar winner Cate Blanchett, according to the Radio Times' Jeremy Aspinall. The action in Taika Waititi's film also sees Hemsworth come to blows with fellow Avenger The Hulk, now a gladiator on a distant planet named Sakaar. His appearance, writes The Guardian's Steve Rose, constitutes "the most fleshed-out performance of Hulk we've yet had in this Marvel universe". The result, says Screen Daily's Tim Grierson, is "a grinningly goofy comic-book movie that reverberates with boyish delight". The Independent, however, does take issue with the film's "convoluted" plot and bemoans its lack of "dramatic urgency". Thor: Ragnarok, which also stars Tom Hiddleston and Jeff Goldblum, opens in the UK and Ireland on 24 October. The Marvel Cinematic Universe that kicked off in 2008 with the first Iron Man film now spans nine years, 17 movies and a vast cast that expands with every new instalment. Success stories don't come much more successful than this one. Even so, though, there have been some parts of this epic superhero tapestry that have been less welcomed than others. Thor is a case in point. Whether toplining his own films or chipping in as part of the Avengers ensemble, this relic from Norse mythology has always seemed out of step with the rest of the extended franchise. By recognising and embracing his core ridiculousness, though, Thor: Ragnarok may have finally found a way to integrate the character and his world into the wider MCU landscape. Despite taking its title from a Norse word for apocalypse, the latest Marvel film is a joyously irreverent hoot in which superhero heroics are almost an afterthought. The scenes in which Chris Hemsworth's Thor banters and bickers with the now-talking Hulk are a delight, as are any in which Jeff Goldblum appears as the ostensibly villainous but actually rather affable Grandmaster. If there is a downside to the film's tactic of constantly deflating its moments of tension, threat and menace, it's that it leaves Cate Blanchett with very little to do as chief antagonist Hela. The two-time Oscar-winner snarls her dialogue with aplomb and sports an antler-like headpiece that could put your eye out. No sooner is her character introduced, alas, than she is promptly relegated to the sidelines. It's a Hela of a waste of a great actress that does little to dispel one's feeling that the MCU - and the superhero genre in general - remains something of a boys' club.